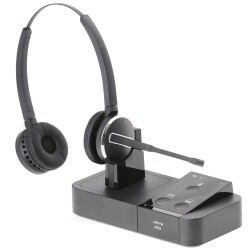 The Jabra Biz 2300 USB Duo Corded Headset is designed to be used with a computer ONLY. The headset is a binaural wearing style - ie it covers bother ears. The microphone can be worn on either side by rotating the boom arm. The Jabra BIZ 2300 USB has been designed specifically for the needs of contact centres that use softphones. 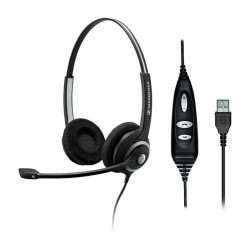 It has HD quality sound, is durable, comfortable enough to be worn all day and has some great features to keep your staff happy. If you have some heavy breathers, this headset is perfect for you! The air shock microphone removes that breathing sound that is so off-putting. As you'd expect, the microphone is noise cancelling to eliminate background noise and wideband to give a natural sounding voice. To protect your staff, all Jabra headsets have PeakStop™ protection to immediately reduce any loud noises to a safe level. The microphone boom arm is 'unbreakable' and spins 360 degrees. The arm is flexible for perfect mic positioning and the headband is adjustable for comfort. The soft foam ear cushions are sized large. One of the weak spots in any headset is the cable. However Jabra have made the 2300 series with a Kevlar re-inforced cord, so presumably it's also bullet-proof. Please don't test that! Duo headsets are not for everyone. Yes, they're great in noisy offices BUT if you're sociable / need to speak to colleagues regularly, you might get annoyed by having to take it off or pushing the earcup off your ear to hear them. The BIZ 2300 USB Duo is custom built for contact centres. It's perfect for busy or noisy environments, tough and reasonably priced as well as providing all day wearing comfort and HD quality sound. For those that prefer a mono wearing style, the one-eared Jabra Biz UC Mono may be a better option to increase call concentration. 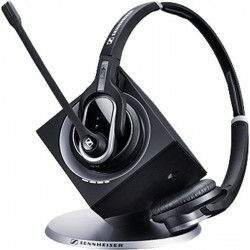 If you're on a tight budget have a look at the Sennheiser SC 60 or the excellent SC 260 USB. Another factor to consider is the extra productivity that can be gained from the freedom to walk away from your desk while on a call. It is worth checking out the Jabra Pro 9450 Duo is a great value wireless duo option and also works with desk phone. If you're buying for an office rather than call centre, wireless is now the norm and your staff will LOVE you for this upgrade. All day wearing comfort - fully adjustable headband and microphone boom. Take your brand’s voice to a higher level with the power of better conversations. 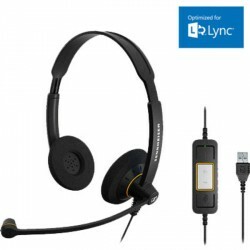 Jabra BIZ 2300 corded headset for contact centers is an investment in world-class sound, high agent satisfaction and competitive total cost of ownership. Keep tour contact center agents happy The Jabra BIZ 2300 for contact centers blends light-weight yet durable construction with an unobtrusive, professional Scandinavian design aesthetic. The Jabra BIZ 2300 works hard, looks great and is designed for easy daily handling. It is a headset built to be comfortable all day long. 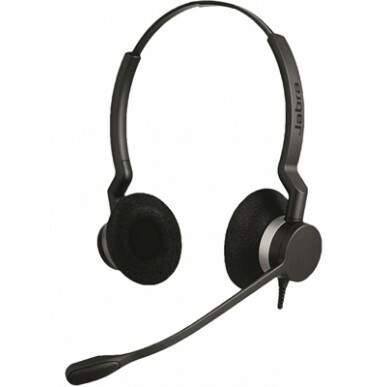 A contact center headsets that is built to last Jabra BIZ 2300 is built with total cost of ownership in mind. Beside 360˚ degree rotating break proof boom arm and Kevlar-reinforced cord, Jabra BIZ 2300 is built to withstand any punishment a high-performing contact center can give. Freespin™The unbreakable 360 swiveling boom arm ensures that end users always have the option to customize the location of the microphone optimally in relation to current needs without exposing the boom arm to any break risk. HD Voice – Wideband Audio Enjoy high-definition sound with HD Voice and get crystal clear, intelligible communication. You get life-like, vibrant conversations where you can focus on the content and don’t have to struggle to understand what the person on the other end of the line is saying. Kevlar® reinforced cord Cords made with Kevlar® help to deliver performance and value to end user by providing excellent robustness, fatigue resistance and durability, which in total contributes to the cords overall quality, and by that reduces the headset’s total cost of ownership. 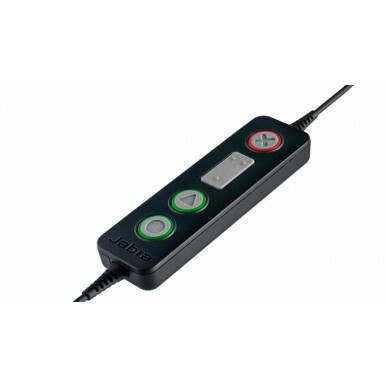 Noise Cancelling MicrophoneNoise-cancelling microphones reduce unwanted background noise and are ideal in crowded and noisy, open office environments. PeakStop™ PeakStop™ technology immediately removes potentially harmful loud sounds or tones before they reach your ears and keeps the sound level within the safe range to protect your hearing. Talk in Comfort Assure total comfort with a range of styles that match your individual needs and personal fit requirements. Our light, rgonomically designed frames along with soft ear cushions, adjustable headbands and microphone boom will guarantee that your headset will be comfortable all day long.